Sales Designations: Unlocking Canada’s Business Potential — RandallAnthony Communications Inc.
“In the past, as a telephone company, we sought very specialized sales talent not in high demand elsewhere. But today, our offering is so large and technology-based that we’re competing in the labour market against companies selling other technologies,” says Louis Morin, vice president, sales performance, with TELUS. The often-frustrated quest for high-quality sales talent is also gripping other industries. Michael Dunlop is director of sales operations with Wolseley Canada, a national wholesale distributor serving plumbing, HVAC, refrigeration, waterworks and industrial markets. With a head office in Burlington, Ontario, Wolseley has 220 branches across the country. “The rules of engagement are changing; everyone can provide product. Our customers are aligning with suppliers who understand their business goals, objectives and challenges, and provide solutions that go far beyond product,” adds Mr. Dunlop. TELUS and Wolseley are among the companies that have turned to the Canadian Professional Sales Association (CPSA) to help them elevate the quality of their sales training. The association has spent the last few years putting in place the building blocks to make the sales role a true profession – with standardized competencies, skills assessment tools and educational frameworks, along with graduated designations that support career progression. The CPSA set out to change all that. “We conducted research on what employers need and worked with our industry partners to develop the competency framework,” Mr. Irwin says. Enhancing career-development opportunities is also designed to attract more people into the sales profession. 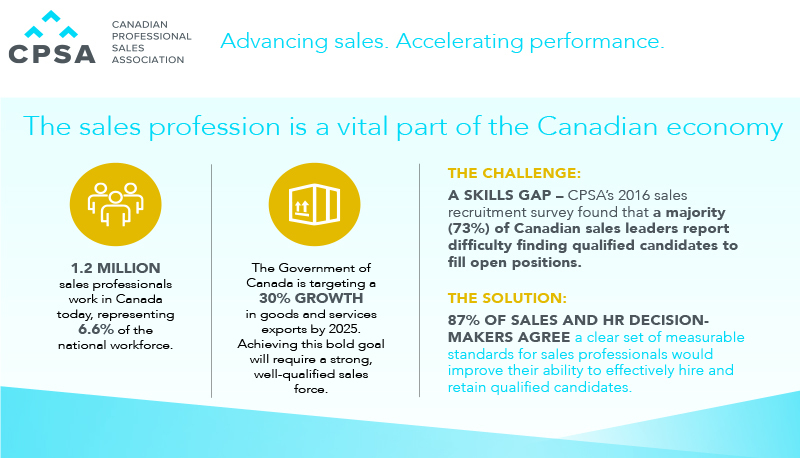 The CPSA has other initiatives designed to make sales an attractive career, including sharing curriculum materials with educational institutions. The Government of Canada recognizes the value of a skilled sales force to support national targets for innovation success and economic growth. This fall, it announced funding under the Sectoral Initiatives Program (SIP) to help CPSA accelerate adoption of its standards and designations. “The Government of Canada is focused on ensuring Canadians have the skills to fill good quality jobs in industries that are in need of workers. The Canadian Professional Sales Association and its industry partners are doing great work creating learning pathways that will benefit job seekers and those working in the industry,” says Patty Hajdu, Minister of Employment, Workforce Development and Labour. Meanwhile, TELUS and Wolseley both say they are already seeing success from integrating CPSA standards into their training. TELUS worked with the CPSA to audit a first-level training curriculum within its TELUS Sales Academy, and this past summer, became the first organization in Canada to have an internal training and development program accredited by the CPSA. Wolseley’s Mike Dunlop is also seeing the benefits of using the CPSA standards and designations – for both junior and senior sales staff. “Today’s young workers expect more. If the new generation coming into our business in sales doesn’t see opportunity for career development and an investment in their continuing education, they will move on.